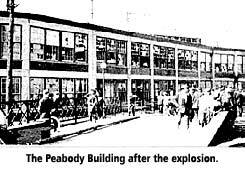 The sympathizers placed a bomb in a hole under the building, next to the old wooden Peabody Bridge. The framework on one side of the bridge was blown away, and the other side was twisted and bent; the concrete crumbled to powder. The force of the explosion also was strong enough to blow out every window in the building. Some of the window sashes also broke and a few sills snapped. Repairs were made, and the building went on to live a long life, becoming the starting place of several companies. RPScherer, which produced gelatin for pharmaceutical companies, occupied the building for several years, as well as Butcher Engineering Enterprises, Lorence Enterprises, Reid Industries, and the McCord Corporation. The building also provided space for Junior Achievement of Windsor. It was demolished in 1985.